Is there a dark side of Christmas? Christmas is only a matter of days away, but there is a part of me that cannot wait for it to just be over with already. Having said that, I love Christmas. I always have. I probably always will. But, there are a few problems on this special journey, even loving Christmas as much as I do. There is a dark side, so to speak. And as I know I am not the only one on this journey who is going through this at the moment, I will share another of our secrets here. An insider’s view into our lives. So, what’s the problem? Ok, make that problems, with an “s”, please. The problem is that I scroll through Facebook and I see so many friends are out at the pub for a holiday gathering or are having a number of friends over to their house for Christmas…and there I am, on Facebook. The invites out, the invites over, stopped coming a number of years ago. The problem is that I will be spending Christmas dinner alone with my 2 sons, as wonderful as they are, but with only a 7 year old to talk to, to share any meal I might (or might not bother) preparing for Christmas dinner. Once again, the invites to come over for dinner stopped coming a number of years ago. The problem is when you’ve hinted and even outright asked to see friends and you’re told they are just too busy to fit you in, it hurts. It hurts like hell. It hurts because we all know that if someone wants to make time for you, they will. It truly is that simple. So, back to problem one…no invites. Alright, so I can see why there are no invites. But are these really the reasons no one cares anymore to invite me and my sons over, knowing otherwise we will be alone and with no plans? As I sit here in the quiet of the night while the boys are peacefully asleep, I have to wonder why. Doubts creep in as the mind begins to consider maybe I am just not that fun or interesting anymore since walking on this often tumultuous journey with my son? Or could it be that society has just changed so drastically that people in general no longer concern themselves about who they know will be alone on Christmas? Have people gotten to the point that they are so involved with their own lives, that they have forgotten their friend who lives each holiday with baited breath wondering if this is the last one for their fragile angel? And note that last point. 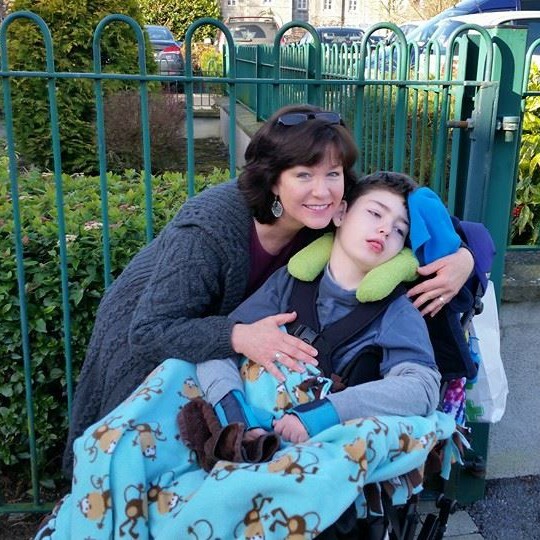 It’s damn hard to live with that fact of our life with a child who has a life-limiting illness, and it’s even harder if friends don’t gather around as a support network. So, dear reader, if you know of a special needs parent…especially a single one…that will be alone during Christmas with his or her child/children, reach out to them. Invite them over. Invite them out. Yeah, sure, it may be difficult for them to get out, and they may not be able to, but at least give them the chance to try. And if that doesn’t work, then go see them in their own home. Remember, Christmas isn’t just about family. It’s about the gift of love. I could cry …. My darling granddaughter, just like your Brendan, except she has 2 loving parents, grandparents and extended family to share the load, rejoice in the good and get through the bad. So sorry you have to do this journey alone. Christmas is a lonely time for many people. Best wishes for 2016, I hope it brings some peace and happiness.